Ju Dizz & Joe Gamble def The Team of Joey “The Bone” Barone & Sgt Major Alexander Paul & The Team of Anthony Idol & Dark Usagi to become the NEW #1 Contenders. “The Athlete” Mike Camden def Little Cholo to retain the championship. Afterwards Anthony Idol would challenge Camden for the championship after winning the Rumble in Oceanside which gives him a shot at any champion. “Mr. 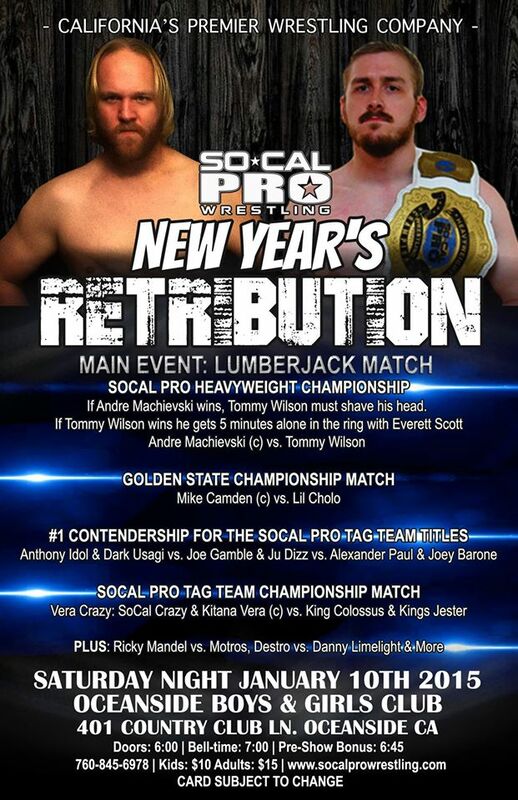 Mega Star” Tommy Wilson def “The Polish Tyrant” Andre Machievski to become the NEW SCP Heavyweight Champion. After the match, SoCal Crazy would turn against long time friend sending Wilson to the hospital.